Hello my lovelies, today I thought I’d update you all with my current skincare routine. I like to keep it simple but effective and the three products I’ll be sharing with you today allow me to do this. I wouldn’t want to talk about a skincare routine until I had tried and tested it myself to see how well it really does work. I’ve been using these products for about 6 weeks now and have really been enjoying the results. I personally have oily, fairly sensitive skin and am very prone to breakouts. For pretty much all of my teenage years I suffered with acne and still get a few hideous blemishes far more often than I’d like. Whilst using these products I have definitely seen a massive improvement in this. 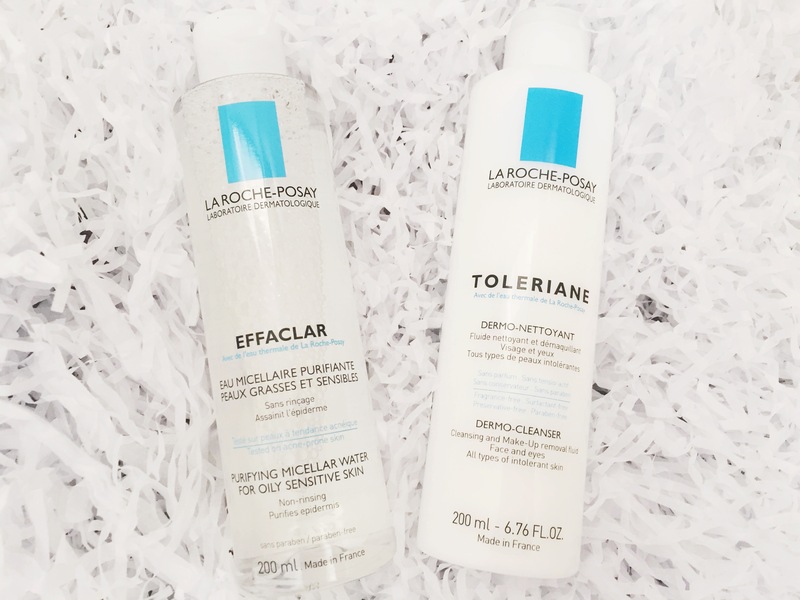 First up I use La Roche-Posay’s Effaclar Micellar Water to remove my make up. The only problem I have with this is to take off my whole face of make up I have to use quite a large amount of product. However, after 6 weeks use I’ve still got way over half a 200ml bottle left. It dissolves the make up really well and although I wouldn’t say it removes every single particle it certainly does a great job. I’ve definitely seen some great results since I started using this product to take off my make up and my breakouts are far less common. La Roche-Posay Effaclar Purifying Micellar Water is for people with oily, imperfection and blemish-prone skin. Suitable for sensitive skin. Gently cleanses the skin by eliminating impurities and excess sebum while leaving the skin feeling clean and fresh. The micellar water is £12 for a 200ml bottle from feelunique which is fairly pricey considering the Garnier one is £4.99 from Boots, for double the product, so considering the massive price difference I may try this one before repurchasing. Step two is where I bring in my Toleraine Dermo-Cleanser (also by La Roche-Posay) to remove any product that the micellar water has left behind. What I love about this product is that you don’t even have to rinse it off, that part is entirely optional. The bottle states that rinsing is optional but to make sure you pat (not rub) your face dry after use. This makes it the ultimate cleanser for a lazy girl. La Roche-Posay Toleriane Dermo-Cleanser is ideal for daily cleansing of dry, sensitive or intolerant skin, gently removing make-up without leaving skin feeling uncomfortable. Contains glycerine and La Roche-Posay Thermal Spring Water. Strict formula charter to help minimise the risk of intolerance. The formula is of the same consistency of a milk and always leaves my skin feeling incredibly soft. In the 6 weeks I’ve been using this product I’ve noticed that my skin looks far less irritated which is always a bonus in my book! Just like the micellar water the bottle I have is 200ml – available for £12.50 from feelunique – which I can see lasting me a lifetime. One small bit goes a very long way with this product which is never something I’d complain about. With this in mind, I would say is to be careful with how much you do use otherwise it may make your skin feel rather greasy. I will definitely be repurchasing this when I do eventually run out. My final step is L’Oreal Pure Zone Moisturiser (the anti-regreasing variety) which I bought on a complete whim because my moisturiser was running out and this was on sale in my local chemist. I’d done absolutely no research and just hoped for the best. I definitely got the best I could’ve hoped for. 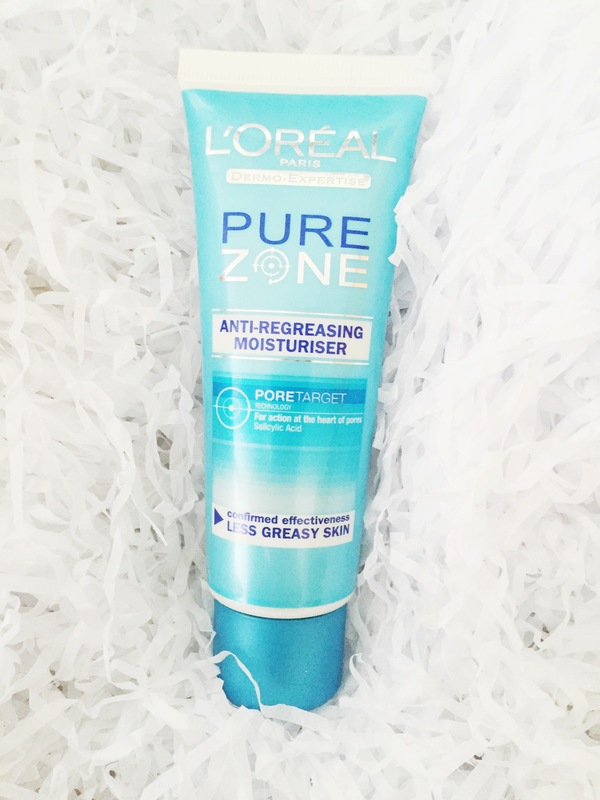 I picked this gem up for £1.50 down from about £4.50 I believe… The only issue with this moisturiser is that I haven’t actually to find it anywhere other than my local chemist apart from someone trying to rip people off on Amazon selling it for £24 a pop. Specically developed for combination and oily skin, it provides lasting hydration and combines anti-regreasing effectiveness with an instant result of smoother and more even skin. This product uses Pore Target technology: a concentration of active ingredients is transported more deeply, to act where they are needed most, at the heart of the proves. Anyway, this moisturiser is pretty much perfect for me. As I mentioned before, I have oily skin which is the skin type that this moisturiser is designed for, along with combination skin. The product definitely helps mattify my skin without causing my skin to dry out and tighten. Although I wouldn’t say there has been a massive difference in my pores since starting this moisturiser 2 months ago they definitely have minimised slightly. I can’t expect miracles. As L’Oreal said, my skin is definitely smoother and more even. For me, the downfall of this product is it’s smell. It smells rather clinical and in my opinion has the slight scent of men’s shaving foam. It’s not ideal but I’m willing to sacrifice the smell of a product if it has some great benefits to it. If you have oily or combination skin and can get your hands on this beauty I would definitely recommend it. Have you tried any of these products? What did you think? If not, what skincare product do you swear by? My holy grail skincare product is 100% the garnier micellar water, it’s literally my life since I first ever purchased it last January (i think) I’ve gone through about 4 bottles of the stuff and i’m on bottle no.5 now. I really don’t think I’ll ever use any other micellar water and I don’t know what I was doing with my life before I started using this! The La Roche-Posay Micellar Water was the first one I ever used, back when only the French skincare brands used to really do them. It’s just a little too expensive for me now, given that Garnier does the same thing. I’m a big lover of Cetaphil these days. Great post! I’ve definitely enjoyed using it but will be looking for a cheaper alternative which will most likely be the Garnier one. I shall have a look into that brand as I haven’t tried anything from them before but I may have to! I’ve never used La Roche-Posay but I’ve always wanted to try the brand! I’m always looking for new micellar waters I’ll definitely be giving this one a try! Great post!